Plus a 7:30pm - 9pm public performance on the 15th February. Plus a 7:30pm - 9pm public performance on the 25th October. Plus a 7:30pm - 9pm public performance on the 1st August. The cost of the course is £590 in total. Upon being offered a place, applicants are required to pay a £250 none refundable deposit to secure their place on the course. The following £340 must be paid in full at least four weeks prior to the start of the course you are attending (24th June deadline for Manchester, 16th September deadline for London). Alternatively, long term payment plans with monthly installments are available. Please email accounts@icat.actor for more details. CANCELLATION POLICY: If you are unable to attend a course that you have paid for, we require at least two weeks notice in order to provide a refund of the fee (less the non refundable deposit). We may allow you to attend another course and transfer the fee over subject to available places. The course takes place over two consecutive weeks (no weekends) and entails in depth work on approaching Shakespeare using RSC, Globe and National Theatre practice, culminating in a public black box, ensemble showing of a condensed Shakespeare play. With astounding feedback from participants across the board, don’t miss the chance to demystify Shakespeare and take your career to the next level! Regular practitioners have included award winning actors Adjoa Andoh and Simon Trinder who have collectively performed in over 25 Shakespearean productions with the Royal Shakespeare Company, National Theatre and Shakespeare's Globe and Head of Voice at the National Theatre’s Jeannette Nelson. Please note: As we are working practitioners, ICAT reserves the right to replace any of the course leaders at any point with an artist whom we deem appropriate. Testimonies and footage from recent intensive. 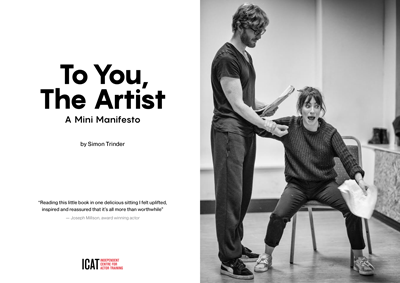 Please submit a one minute self taped Shakespearean monologue/soliloquy of your choice to info@icat.actor. We ask that you learn some­thing in verse. Strong audi­tions will be fol­lowed by a phone inter­view with ICAT Prin­cip­al Simon Trinder. Though we guar­an­tee buck­ets of fun, as the title would sug­gest, the course is intense, and there­fore we are as inter­ested in atti­tude as we are in abil­ity! I had a fantastic time. I feel empowered to audition for the big guns and ready to hold my own when I get there. I felt like we arrived as a company but left as an ensemble. I learned more about Shakespeare in this two weeks than I ever did at Drama School.